Below are all of Katheryn’s longer term ensemble projects past and present. Current projects are nearest the top. BALKAN SHMALKAN is East Vancouver’s sweet dance party orchestra; think global music with local attitude. Their funky brass dance beats are rooted in the aural traditions of the Roma and Klezmorim of Eastern Europe and blended with a mixture of pop and jazz. Members of the group sing in 5 languages including Serbian, Romani, and Italian. TEAPOT IN THE TUBA is Mike Allen on clarinet and Katheryn Petersen on accordion. This portable and evocative duo plays well in smaller acoustic settings but can also grow to fit larger venues and events with the addition of bass, violin, drums and other musician friends (including a much adored tuba player for special occasions). The name of the band comes from the idea of a couple having to flee difficult circumstances to start a new life. They are taking only the essentials with them; their tuba and a teapot, which conveniently fits perfectly inside the bell of the horn. SOMETHING ABOUT REPTILES is a notorious Turkish recording band led by Burcu Ozdemir. This epic group has toured internationally and regionally and is considered a local treasure in the cultural scene of Vancouver. Reptiles events are legendary and band members include a stellar line-up of musicians: Alison Jenkins accordion, clarinet and vox, Noah Walker guitar, Katheryn Peterson accordion and vox, Amrit Basi darbuka, Russell Sholberg & Michael Alleyne standup bass, Amelia Rose & Elliot Vaughan on violin and viola. Katheryn has played accordion with the Reptiles for over thirteen years. THE ANDY TABB WELCOME BAND. Andy’s soulful sound draws its roots from Americana music but adds unexpected, painterly touches of baroque fingerpicking on slide and acoustic guitar. Andy’s voice evokes the ease of a summer afternoon, as he ranges from melancholy ballads to raucous crowd-pleasers. He has an enthusiastic and growing following in BC. The band line-up includes Katheryn on accordion, Elliot Vaughan on viola, Martin Reisle on banjo and cello and the fabulous songbird Anna Baignoche on cello, guitar and golden vocals. 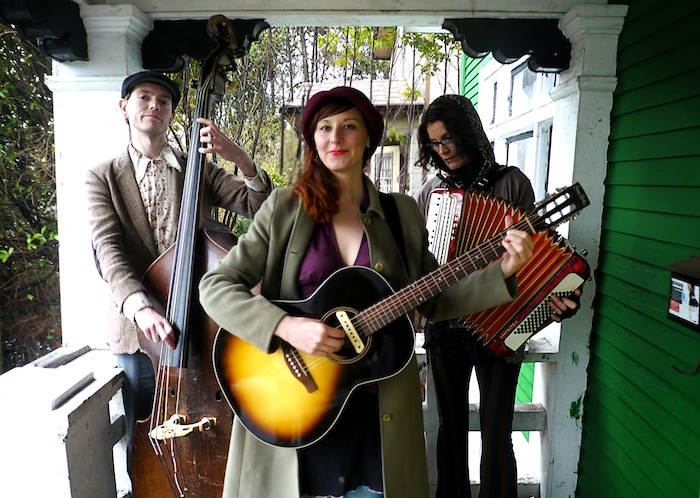 GREEN PENNY FOLKS is a musical trio headed up by singer/songwriter Dawn Boudreau. 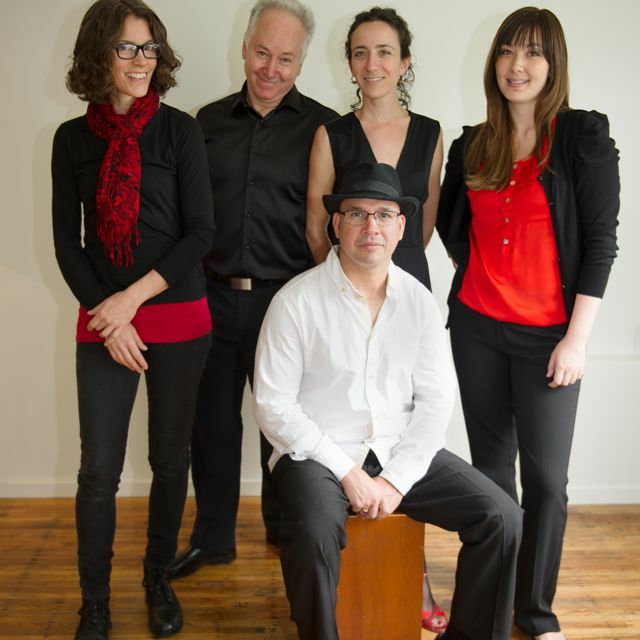 Piano, reeds and accordion create a unique backdrop for Boudreau’s naturally warm vocals and jazzy songwriting talents. Dawn’s songs tell everyday stories of family, children and loves lost and found with kindness and an exceptional sense of humour. Mike WT Allen adds a distinctively powerful voice to the music with his instinctual sax and flute playing and Katheryn adds romance and intrigue with her accordion. The band name pays tribute to Dawn’s musical upbringing in the mystical community of Penny in the green mountains of northern BC. STRINGS AND SQUEEZE is a serendipitous pairing of fascinations within the realm of the discarded. The work of Salmon Avalanche and Wryly Andherson of Moth Orbit Object Theatre is bound together by wheezy old bellows, recycled body parts, and tangled threads. Together they celebrate discarded and beleaguered characters who move through life’s inequities with differing degrees of regard for the status quo. They give voice to the idiosyncratic and oft tragic solutions that these little people have devised to escape their oppressive fates and to remember their own wild and regal natures. LINDY & THE CROW’S NEST digs through the closets of our deepest desires while simultaneously tickling the funny bone of the skeletons we left there. Expressive bass lines by Wynston Minckler and precise and sardonic accordion sketches by Katheryn Petersen intertwine around the strange and compelling beauty of Lindy’s voice and musical saw, as she leads us astray through her dark imagined romances. Here they are playing a thirty minute set at the Global Civic Public Policy Salon at the Vancouver Playhouse. Video Credit to Shawn Lam Video Inc. and big props to Sam Sullivan and Lynn Zanatta for their generous support of local indy musicians. VAUDEVILLE VAGABONDS A musical & theatrical cabaret extravaganza! Enmeshed within the themes of old carnivale, Neo-Victorian & Stageshow. Madness! We unleash for your entertainment and gawking spectacularity! Reverend Heathen StrangeFellow and the VaudeVille Vagabonds: A full live stageshow with a monster hunting ringmaster, deranged musicians, strip teasing clowns, zombie burlesque dancers, countless interactive audience shenanigans, and belly dancing succubi among countless wonders and freaks beyond description! 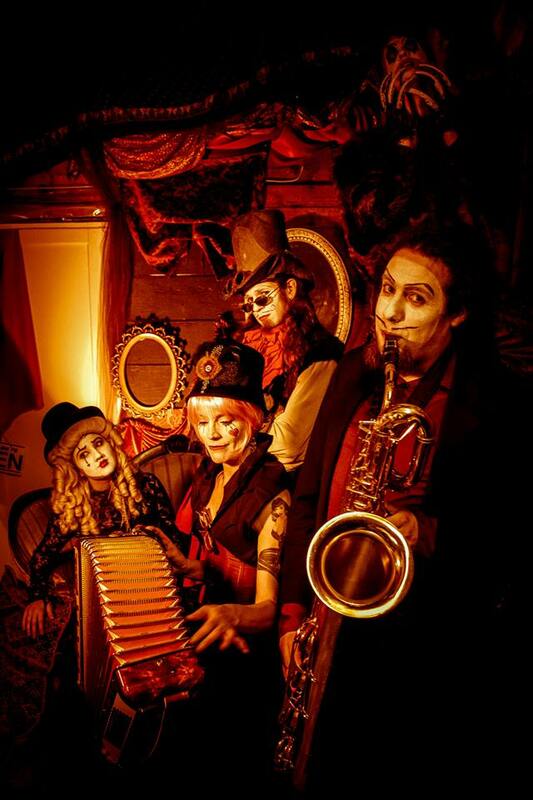 With a shapeshifting ability to modify to almost any event the vaudeville vagabonds offer a range of music from acoustic vaudeville awing in the tone of Tom Waits and old dusty circus tunes, to a fully electronic drop down of gypsy glitch-swing step. Musically consisting of standup bass, baritone saxophone, clarinet, bass clarinet, accordion, drums, electro manipulations and vocals. We invite you to invoke the awesome absurdity of Reverend Heathen StrangeFellow & The VaudeVille Vagabonds. GLITTERING KINGDOM spins a sparkly web of sonic alchemy, slacklining between lonely circus swing, prohibition-era jazz, folk noir and post-apocalyptic acoustic. 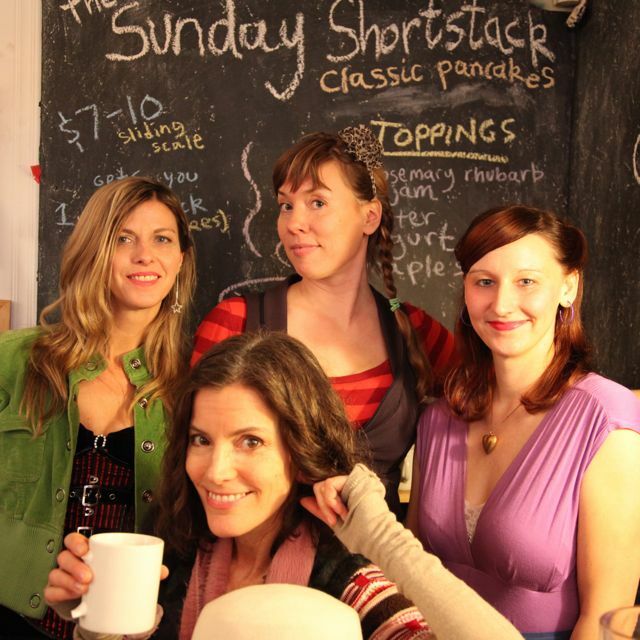 Taking cue from the gypsy conductor behind the veil, these four gals (Katheryn Petersen, Lindy Gray, Jen Rashleigh, Sarah May Redmond and Belinda Bruce) twist and braid fine harmonies amidst guitar, accordion, saw, harmonica, melodica, kazoo and tinkly percussion. As a newish band (only one year old!) they already have an impressive gig list under their wings having shared the stage with celebrities as different as Canada’s Poet Laureate and the King of East Van, CR Avery. Check em out at the Tom Wait’s Tribute at the Rio. JOANNA CHAPMAN-SMITH has a supple and finely-nuanced voice; writing with “the ear of a poet” (The Georgia Straight) and a wisdom beyond her years.She has toured extensively in the UK, Belgium, Denmark, The Netherlands, Germany, Italy and the USA. Katheryn toured with Joanna in the Winter of 2011 and had the great pleasure of joining Joanna for her third album release, LOVE ME DEEPLY, at the Rogue Folk Club in March 2013. Katheryn will be joining Joanna again this summer for some fun gigs on the sunshine coast. LOS PORTEÑOS DEL NORTE takes inspiration from the tango and other musical traditions of Argentina, the group delivers fresh interpretations of classic and popular songs, featuring violins, vocals, accordion, piano, guitar and guitarron. Katheryn has enjoyed playing with Los Porteños del Norte’s for over two years. Their varied repertoire and accomplished players makes them an ideal choice for public events and elegant dances. Los Porteños del Norte’s passion for the music of Argentina is a great way to celebrate a alegría de la vida (the joy of life). For more information, please contact Michelle Cormier at 604.440.2355 or rozacormier@gmail.com. 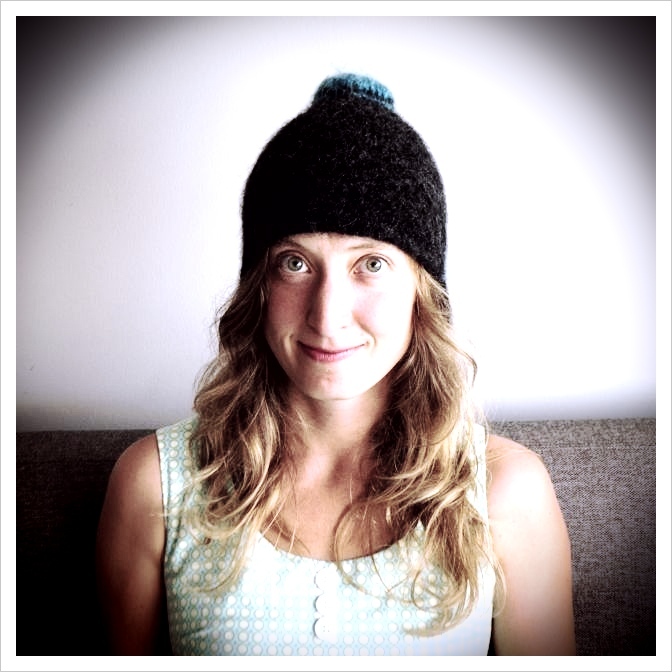 MELISSA BANDURA is a Vancouver-based Independent Folk musician and multi-instrumentalist who uses her classical background to texturally arrange her songs. Melissa’s softly powerful, haunting vocals thread their way through her diverse range of flowing melodies and quirky song structures. Building on her background in folk-roots sounds, Melissa crosses into slightly darker territory with the music that graces her first solo album, Dark Dreams. Katheryn recorded and toured with Melissa the summer of 2012. BLACKBERRY WOOD is a wonderful, secret and magic combination of alt-country-gypsy-circus music. A high-energy cabaret spin on old and modern music adding juicy flavours like jumpin’ ska, skiffle, folk, punk ‘n many other irresistible body shakin’, foot stompin’ delights to their original and timeless-down home-ol’ style adventures. Blackberry Wood comes down the road like a travelling caravan, with all kinds of wondrous instruments, vocal melodies and fantastically costumed characters. Blackberry Wood has kicked up dust in towns all over Western Canada, the United Kingdom and parts of the United States. Katheryn gigged and recorded with Blackberry Wood for six years, touring internationally and regionally up until May of 2010 when she split off to pursue other projects.